Preheat oven to 425 degrees. Use ovenproof individual au gratin dishes. Place a small amount of mild salsa in the bottom of each dish, covering the bottom of the dish about 1/2 inch thick. Break two eggs into the salsa. Cover with shredded sharp Cheddar Cheese. Bake for 7-8 minutes until the egg is set, and the cheese is melted. Baking time will vary depending upon the number of dishes in the oven and temperature of the ingredients. 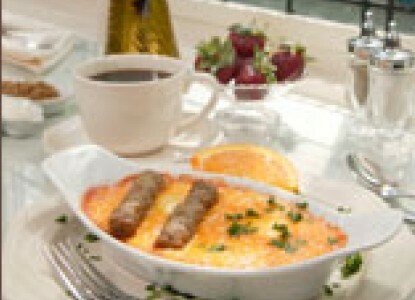 Serve with hot sausage on top of the melted cheese and a sprig of parsley for a colorful dish. You may use a hot salsa if you know everyone likes a spicy breakfast.